While at DragonCon over Labor Day weekend, I was fortunate enough to meet famed comic artist George Perez! He’s super nice and really seems to enjoy meeting fans. First I saw him on the Avengers Assembled panel, then later that afternoon he was at his table in Artist Alley. I went to his table hoping to get a comic or two signed. Then I found out that George does head-sketches on the spot in exchange for a donation to the Hero Initiative. I didn’t hesitate for a second in asking for Firestorm! George draws one of the most recognizable Firestorms out there. After co-creator Al Milgrom’s run on Firestorm volume I, George Perez was essentially the next regular artist for Firestorm (on JLA and the Firestorm back-up stories in the Flash comic). 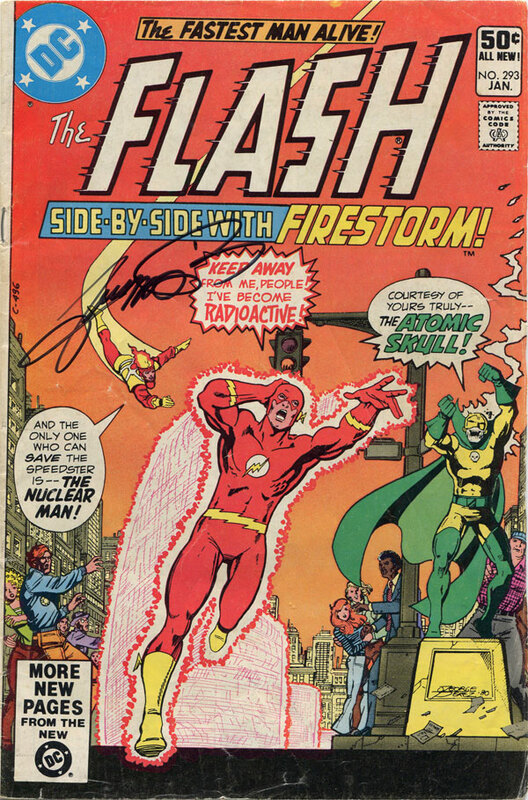 George also took the time to autograph one of my favorite Flash issues for me, number 293. The lead story was about the Flash fighting the Pied Piper. While I love some classic Flash/rogue stories, my real interest lies in the second story. The back-up story was written by Gerry Conway and drawn by George Perez. It detailed a team-up between Firestorm and the Flash as they combined forces against the Atomic Skull. This was the first Firestorm back-up story I ever read in the Flash, which may be why it’s one of my favorite issues. Regardless, great comic, breathtaking cover, and a super-cool encounter with George Perez. 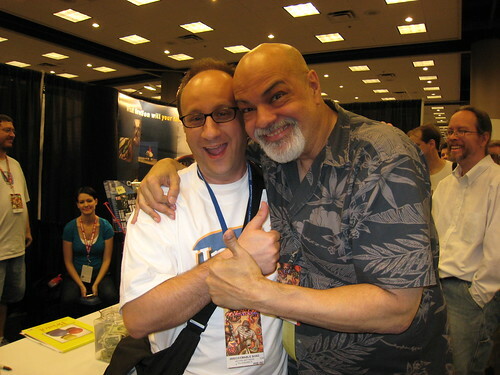 Below is a picture of myself and George Perez. See how cool he is? How many other celebrities get up on you like that for a picture? For complete coverage of my DragonCon experience, please visit my other blog ONCE UPON A GEEK. 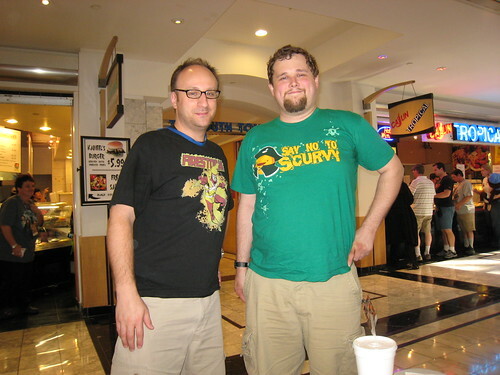 FIRESTORM FAN and the Green Arrow blog (Dispatches from the Arrowcave) are teaming-up today to bring you coverage of a titanic meeting of the minds at DragonCon 2009. I had the opportunity at DragonCon this year was to meet Adama, the man behind the Green Arrow blog. While Adama and I have worked together on a few blog crossovers, we’ve never met face-to-face. In fact, Adama is the first person I’ve ever met from the superhero character-specific blogosphere. Adama and I met at the Hilton and then grabbed lunch in the mall. Adama is a really friendly guy! We talked about all manner of geek-related things. Then we walked around together taking pictures of cool costumes. Surprisingly enough, we kept running into acquaintances. Considering there were over 30,000 people at the convention, it’s pretty astonishing that we ran into that many people we already knew is such a short amount of time. Below you can see myself and Adam. Notice my Firestorm t-shirt and Adama’s green shirt (represent!). We’re such dorks! 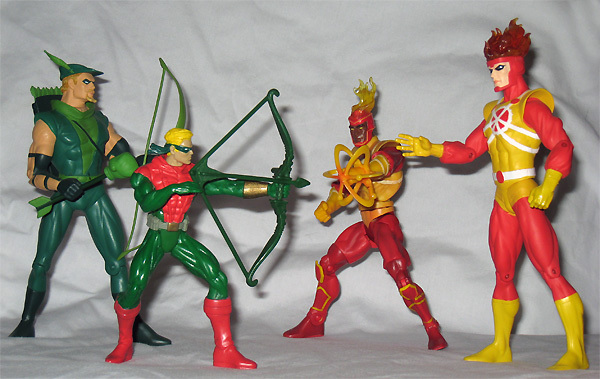 If you’ve never visited the Green Arrow blog (Dispatches from the Arrowcave), then you should really swing by. Adama keeps it interesting. 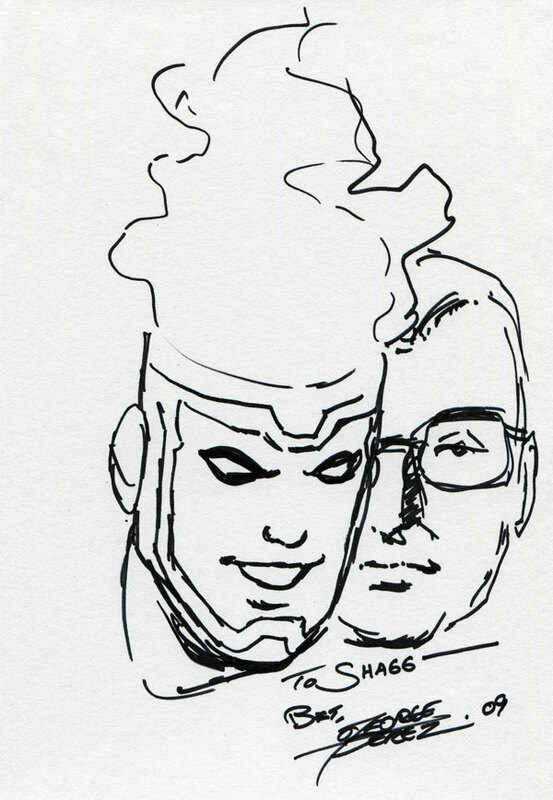 Today he’s running a post about his own George Perez sketch and his version of our meeting at DragonCon. Great to meet you, Adama! Hopefully we’ll see each other again next year. Who knows, perhaps some of our other superhero blogging friends will come to DragonCon in 2010. Support Firestrom (and Green Arrow)! Fan the flame! Posted in: Comic books, Crossover, Firestorm #01: Original (Ronnie/Martin), Flash back-up stories, George Perez, Professor Martin Stein, Ronnie Raymond, Sketch/Art, Toys. You have to watch out for that Adama. He’ll infect you with his bleeding heart leftist propaganda! At some point he and I’ll have to do a Southern Hospitality thing at DragonCon or HeroesCon and play host to all the out of town bloggers. Wow – George is one of the comic creators I’d kill to see. He’s always seemed such a nice guy and well his work speaks for itself! Glad you had a great time! Yep, that is one of my favourite comics ever, for similar reasons as yours. It was just such a fun story for such a small number of pages. Seeing flash zoom around the city from a bird’s eye view was a lot of fun and seeing flamehead get drunk from the energy absorption was cool too. I think what I loved the most was seeing Flash play wisened mentor and really helping out his younger JLA mate.